Well-stocked roomy kitchen with separate dining area seats 6. Master bedroom with 4-poster double bed. Sunny and freshly appointed bedroom with 2 twins. 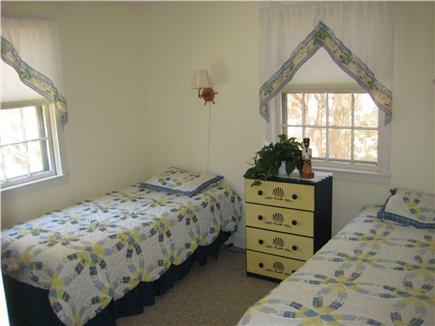 The third cheery and bright bedroom with 2 twins. 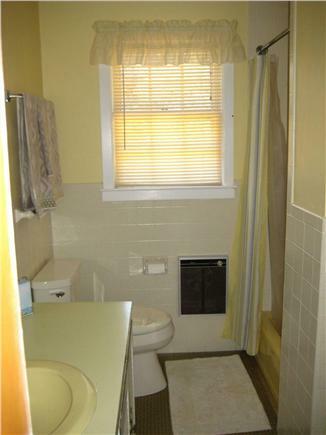 One of two bathrooms; this one located near bedrooms. Another view of side deck; grill and outdoor shower out back. 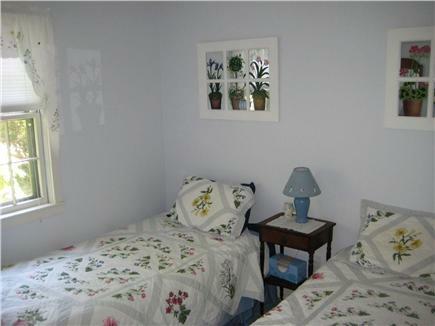 Are you looking for a charming and comfortable house for your next Cape Cod vacation? 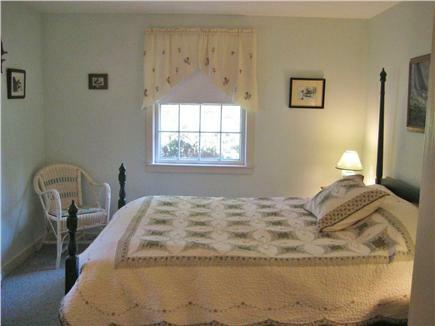 Thyme & Tide is a classic Cape cottage with 3 bedrooms and 2 baths. 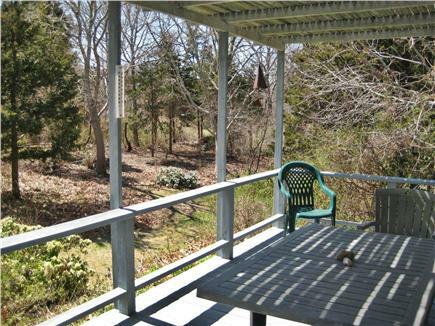 Its one-floor living allows for plenty of room to spread out; there's also a spacious deck and a large private yard. In a quiet, residential neighborhood, the cottage is just a ½-mile walk to Skaket Beach on Cape Cod Bay, where you can walk for miles exploring the sandy flats at low tide and see magnificent sunsets. 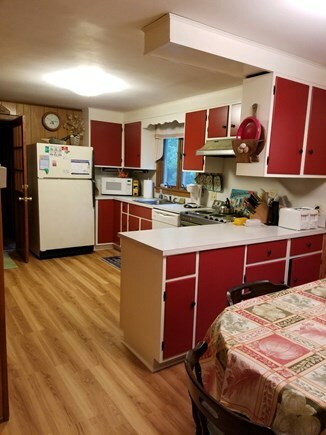 Freshly decorated with colorful simplicity, this cottage provides all the advantages of home -- fully equipped kitchen, laundry, Wi-Fi, home entertainments, deck, and an outdoor shower. We also have very reasonable rates. This home is ideal for a family or several couples traveling together. 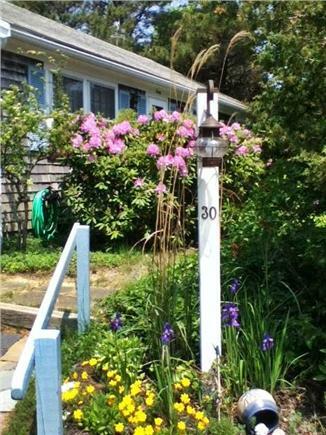 Nestled back in a quiet neighborhood on the way to Skaket Beach in Orleans, this house is a close drive or lovely walk to town shops, restaurants, the Cape Cod Rail Trail, Cape Cod Bay beaches, and two freshwater ponds for swimming. Orleans' famous Nauset Beach on the Atlantic Ocean is a short drive away; reach the National Seashore Headquarters in Eastham in under 20 minutes. The location is ideal for exploring the lower Cape regions of Chatham, beautiful historic Brewster, Harwich, and Eastham. The wilder outer reaches of Wellfleet, Truro, and Provincetown are all within 30 miles. Additional pricing info: Ask about discounts for mulitiple week rentals!, State and local taxes of 12.45% will apply. "Thyme and Tide" --Our Bliss! We were so grateful to find a great family vacation spot for ourselves, our daughter, and her 2 children. The cottage is a perfect location for younger children (6 and 9) as it is located in a neighborhood with safe biking for the whole family. 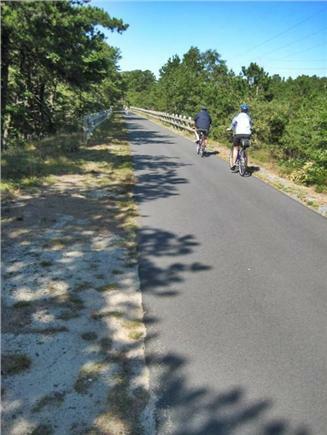 It is possible to walk to Skaket Beach through the neighborhood path. Nauset Beach and town are a short drive away. The house was fully equipped, except linen. Please note, master bed is queen, not double. Thank you Cape Cod Linen rental for exchanging the sheets so quickly. I cannot say enough about how helpful Laura was from first contact requesting info re: cottage, financial arrangements due to our Canadian/US banking issues, to meeting us the day of arrival. 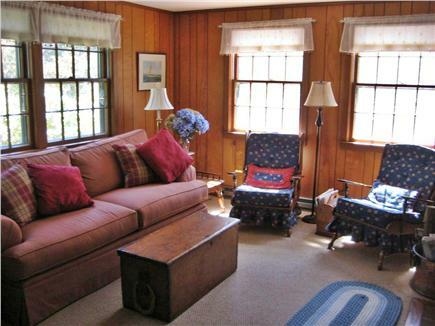 We had a wonderful time in this perfect Cape Cod cottage. It was a 10 minute walk to Skaket, our favorite beach, and we enjoyed sitting on the deck and feeding peanuts to the birds and chipmunks. Such a beautiful, quiet setting. Such a relaxing time. Thank you! Thank you for a great vacation! The house was wonderful and you guys had supplied everything we needed to feel at home. We loved listening to the birds on the porch while drinking our morning coffee and the beach was absolutely gorgeous. 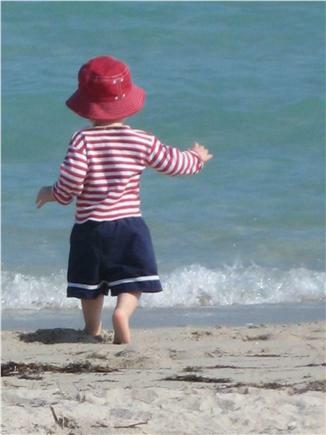 We will definitely be keeping you in mind for future rentals! The house was really nice, close to the small beach (10 minutes walk) and the big beach (10 minutes by car). We enjoyed the area and the fact that we had everything we needed. We recommend this house to everyone. Our family of five had a wonderful, comfortable and most convenient week at this classic summer house. There was room enough for even more, and we enjoyed hosting outdoor suppers on the deck and watching the children play in the spacious back yard. Each bedroom was colorful and well decorated; and the 2nd bathroom was a much-appreciated convenience as were the dishwasher, washer and dryer. We had all the comforts of home with the incomparable advantages of beaches, bike trails and all the splendors of summer on the outer Cape.